When I was 19, I spent two weeks in central Italy. I had studied Italian language in university and, like most, was obsessed with Italian food, but I knew nothing about Italian wine. That wouldn’t change for a few years but I did get a glimpse into my love affair with wine (and Italy for that matter). I stayed at a beautiful Tuscan-style home, surrounded by vineyards, olive groves, and rolling hills. Everything about the home oozed Italian charm. We spent most of our days lounging by the infinity pool or visiting nearby villages. I even learned how to roll gnocchi! What could possibly make all of this even better? Oh, I know! Wine! The host had no shortage of great wine and always had a house full of friends to enjoy it with. We drank wine with lunch as, in the true Italian way, we discussed our next meal. We drank wine as we sang songs around the campfire. My memories are my first trip to Italy are those of people laughing, sharing stories, and connecting with a glass of wine in their hand. It was here that I discovered wine’s ability to bring people together, which is usually the first thing I say in response to people asking why I love wine. My very first wine tasting! That trip to Italy and Europe when I was 19 was my first long-term travel experience and left me with the insatiable feeling to see the rest of the world. I was still in school and couldn’t afford another trip to Italy so I did the next best thing – I started working at an Italian restaurant. It wasn’t your average eggplant parmesan, fettuccine alfredo Italian restaurant though. The restaurant was unique in every sense of the word – the menu, the decor, and the wine. There was a retail wine shop in the restaurant and a sizable wine list. Because I wasn’t a waitress, I didn’t really have a good reason to attend employee tastings. I managed to sneak into a few but remember feeling completely and totally lost, finishing my wine before everyone finished smelling it or talking about the tasting notes. I also remember many times after a long shift, asking the sommelier to help me pick out a bottle of wine, and trying to describe what I liked but unable to find the words. Once again, I found myself in Italy. Wine, pasta, and gelato were welcomed sights after traveling in Southeast Asia for three and a half months. I tried to take advantage of the cheap prices of Italian wine and my motto quickly became “a bottle a day keeps the doctor away.” After telling a friend about the type of wine I liked – which I could kind of, sort of, just a little bit, describe by now – she responded with “wow, you really know what you are talking about!” I really didn’t. It was that moment though, that I decided that I did want to know what I was talking about. Within a few months of returning to the States, we found ourselves in the middle of California wine country and finding a job in one of the many tasting rooms was an easy task. The property, surrounded by vineyards, included an amazing 3-acre culinary garden. 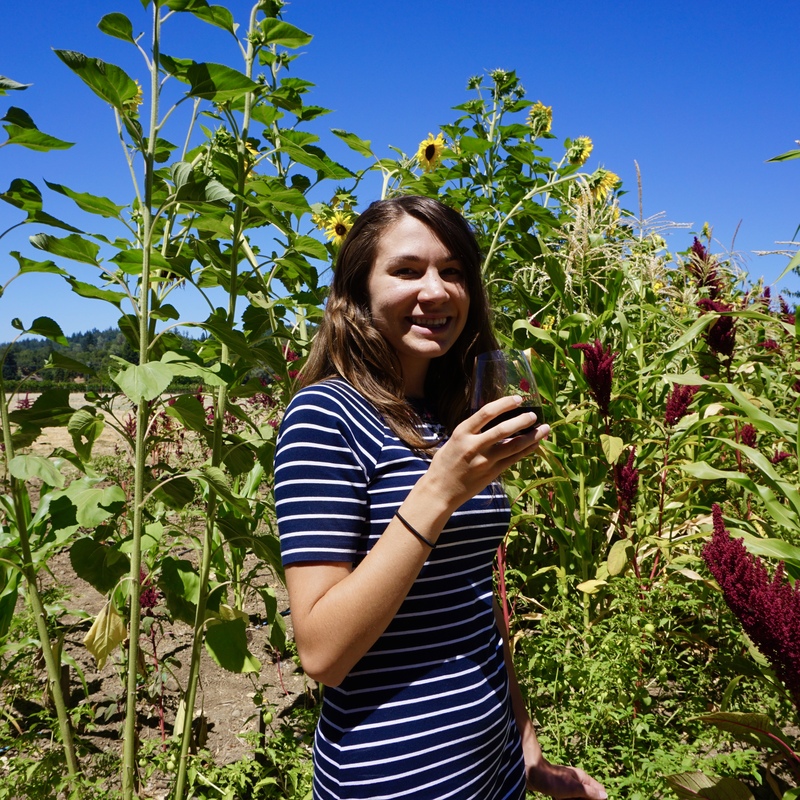 One of my favorite parts of the garden was the “sensory garden,” an area dedicated to vegetables, fruits, and herbs that were commonly used as descriptors for wine aromas and flavors. Each day, I heard the chefs describing why they paired a certain food with the wine and vice versa. I had the chance to taste the pairings and go home with quality wine to try my own food and wine pairings. I am grateful for the six months I worked in the wine and food program for helping me develop a solid foundation of wine knowledge, recognizing wine’s ability to enhance flavor and aromas in food, and learning the art of storytelling in wine sales. Not a bad place to enjoy a glass of vino! For the first six months I worked in the wine industry, it was easier to admit that I knew a lot about wine than it was to admit I still had so much more to learn. I was working for the same company but no longer working directly with wine. I missed it. I wanted to learn more. That July, I decided to take the Level 1 Sommelier exam from the Court of Master Sommeliers (CMS) and six months later, I took the Level 3 Theory and Tasting Exam from Wine and Spirits Education Trust (WSET). Taking these exams brought my love of wine to a whole new level. It was the first time I was actually excited to study something. I discovered that I love the challenge that wine brings – from trying to memorize the grand crus of Burgundy to the mystery that is each and every bottle of wine. The WSET exam in particular forced me to get out of comfort zone by hosting tastings, meeting new people, and trying hundreds of new wines. Each time I open up a new wine book, I am humbled by the fact there is always something new to learn. That brings me to where I am today! I passed my Level 1 Sommelier Exam and the WSET Level 3 Tasting with Merit but am in the process of studying to retake my WSET Level 3 Theory. I am by no means claiming to be an expert in any of the articles on this blog, I just want to share my love of wine with all of you!